From October 25-27, FAME will exhibit at Medientage in Munich. Visit us at booth G1. Together with Institut für Rundfunktechnik (IRT) we'll present an 360° Video-/Audio-App for HbbTV. It is a further development of the Fraunhofer FOKUS Cloud-based 360° Video Playout for HbbTV. 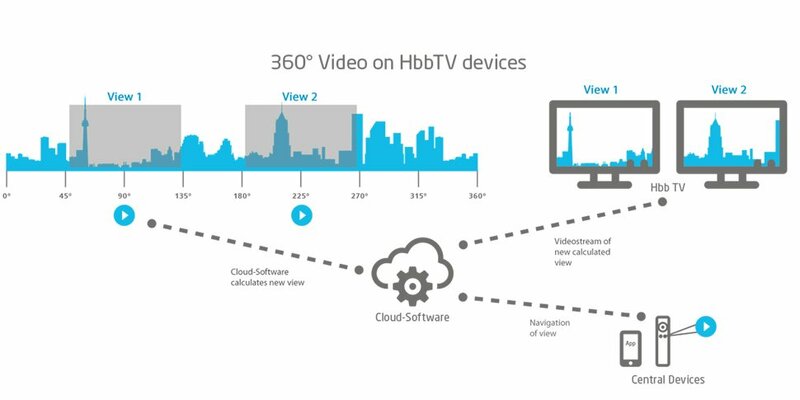 The Fraunhofer FOKUS Cloud-based 360° Video Playout for HbbTV for HbbTV makes it possible to watch 360° video content on low capability devices such as HbbTV. The videostream is rendered on server side what allows high quality 360° video live streaming with low latency. The object-based audiorender by IRT converts data streams for different platforms, e.g. to the formats binaural, Stereo-Ton and 5.1-Surround. The combination of audio and video rendering enables high quality 360° Video-/Audio-experiences on HbbTV as well as on mobile devices. The HbbTV 2.0 specification introduces a number of new features that support companion screens and improve the synchronization of broadcast and broadband content. The HbbTV 2.0 CS and Media Synchronization Framework by Fraunhofer FOKUS implements these features. It offers a set of modules and libraries that allow the viewer e.g. to watch additional content on companion screens or to personalize audio tracks on companion devices and choose from multiple camera perspectives. The Silent TV-function enables multiple viewers in a room to watch a TV program silmultaneously in different languages. Viewers select their individual audio content on a companion screen and listen to the audio stream by headphones. 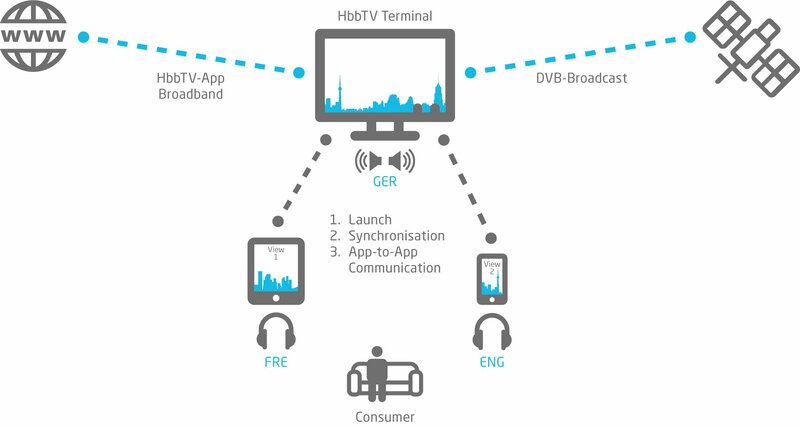 The Silent TV-function with audio- and video-synchronization can be easily integrated in existing HbbTV applications.